Luton Town wasted a great opportunity to move further clear at the top of the League Two table, beaten by promotion rivals Wycombe Wanderers this evening. With Notts County not in action, a victory for the Hatters could have seen them extend the gap to 12 points, but from the moment Nathan Tyson opened the scoring, they were always playing catch-up against a Chairboys side perfectly drilled in the dark arts of managing a game. Although Elliot Lee scored twice to try and raise a grandstand finale, Luton could barely muster a shot in anger during nine minutes of stoppage time, as Wanderers climbed to second, now only eight points adrift. Hatters boss Nathan Jones made two changes, the Lee brothers returning for Jordan Cook and Harry Cornick, but the Chairboys got off to a perfect start, taking the lead in the second minute as Tyson was given the freedom of Kenilworth Road to reach a ball over the top. Although his effort was saved by Marek Stech, the striker showed good awareness to tee up Paris Cowan-Hall who drilled into the bottom corner from 18 yards. It should have been 2-0 just moments later, the unmarked Tyson heading straight at Stech, as Wycombe's electric opening continued, while Luton, who looked so solid and disciplined with 10 men at Grimsby on Saturday, were alarmingly all over the shop at the back. Missing a player of the ilk of an Alan McCormack to get in amongst the visitors' midfielders, Hatters were second best all over early on. To their credit, they finally started to grow into the game and were close to levelling as Elliot Lee's low curler palmed away by Scott Brown, Joe Jacobson blocking James Collins' follow-up. The Wanderers keeper, when not taking timewasting tactics to new depths, made an even better stop on 29 minutes as Collins' low effort took a deflection, and he sprang to his left to palm behind for a corner. Elliot Lee worked some space but couldn't keep his shot down, while Wanderers had a second after some shocking Town defending from a corner, Tyson left in acres of space to crash home from close range. Luton had lifeline on 44 minutes when Olly Lee's glorious low cross was turned goalwards by Collins, as Brown made a brilliant reaction stop. However, the rebound was fed to Elliot Lee and his low shot beat Brown, just, to nestle into the bottom corner. In the second period, the goalscorer set off on a mazy run, beating three challenges, only to shoot straight at Brown, while Alan Sheehan's curling free kick drew another quite brilliant stop from the Chairboys' pantomime villain between the posts. Wanderers appeared to have put the game to bed on 70 minutes when Town were caught out once more from a ball over the top and this time Tyson made no mistake, racing away and slipping his shot beyond Stech. It was back in the balance once more with 12 minutes to go though, Elliot Lee bagging his second of the night, beating Brown at the second attempt. 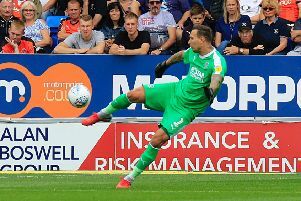 Stech kept Luton in it from Scott Kashket's deflection, before Town had their best chance in the last minute, Harry Cornick going clean through but faced with Brown, shot straight at the custodian. Hatters: Marek Stech, Jack Stacey, Dan Potts, Johnny Mullins (Pelly-Ruddock Mpanzu 57), Alan Sheehan (C), Glen Rea, Olly Lee (Lawson D'Ath 78) Luke Berry, Andrew Shinnie (Harry Cornick 69), Elliot Lee, James Collins. Subs not used: James Shea, James Justin, Akin Famewo, Aaron Jarvis. Chairboys: Scott Brown, Joe Jacobson, Dominic Gape, Adam El-Abd (C), Marcus Bean, Paris Cowan-Hall (Scott Kashket 82) Luke O'Nien, Tafari Moore (Curtis Thompson 83), Adebayo Akinfenwa, Nathan Tyson (Craig Mackail-Smith 76), Dan Scarr. Subs not used: Nathan McGinley, Will De Havilland, Nick Freeman, Yves Ma-Kalamby. Booked: Cowan-Hall 72, Tyson 74, Mackail-Smith 79, Brown 85, Potts 90. Hatters MOM: Elliot Lee. Brace gave Luton hope.